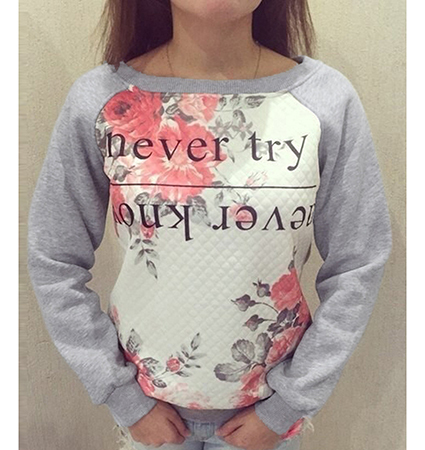 This is a modified version of a traditional women’s sweatshirt. Rather than the conventional crew neckline, this women’s sweatshirt has a much more graceful, rounded neckline that is wider and more feminine looking. It comes in gray and off white with a lovely floral design in various shades of coral and gray. It features gray at the top of the bodice. The sleeves and back of the garment are also gray. The long sleeves feature knit ribbed cuffs. The same type of knit ribbing appears at the hemline of the garment. A printed logo appears on the front of the sweatshirt. This garment is available for purchase in sizes Small, Medium, Large and Extra Large.